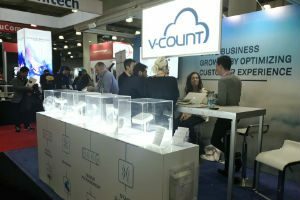 V-Count at NRF 2018 Retail’s Big Show! No Comments on V-Count at NRF 2018 Retail’s Big Show! Once again, technology was at the center of attention in NRF’s Big Show this year. While retailers’ focus was back on their brick and mortar stores and how to optimize customer experience in physical spaces, technology was the means to achieve success. From big name retailers to local chains everyone was looking for ways to get closer to their customers who visit their physical stores and find better ways to service them. Packed with providers of best available technologies supplying every accessible data out there, Expo floors were the reflection of the online debates that has been going on since the last Show. Regardless of their size, retailers were determined to find the best fit for their needs pacing the floor, occasionally stopping to take a peek at the sessions. While AI was one of the buzzwords of the year, it was agreed upon that retailer decisions driven by deep learning was not only a customer engagement tool in e-commerce anymore but also an indicator of success in brick and mortar stores. Supposing magic mirrors are another step away, retailers were immersed in finding easily attainable tech products without neglecting the potential that the future holds. As Beth Ferreira of FirstMark Capital put it, “all companies will become technology companies” eventually. We are proud to have participated as a sponsor and exhibitor in the biggest retail event of the year. We were thrilled by the tremendously positive feedback we received all those days and we would like to thank all of our guests who visited V-Count booth and had the chance to see in action our innovative products and solutions. We are delighted to meet you and we would like to renew our appointment for next year!